Women's 'Alais' slippers from Dunlop with a cable knit construction and multi-coloured flecked design. Accentuated with an oversized faux fur trim and decorative double pom pom detailing. 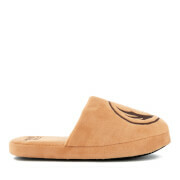 Complete with a comfortable footbed and durable sole.